Ranking Digital Rights ranks the world’s most powerful internet, mobile, and telecommunications companies on their commitments and disclosed policies affecting users’ freedom of expression and privacy. 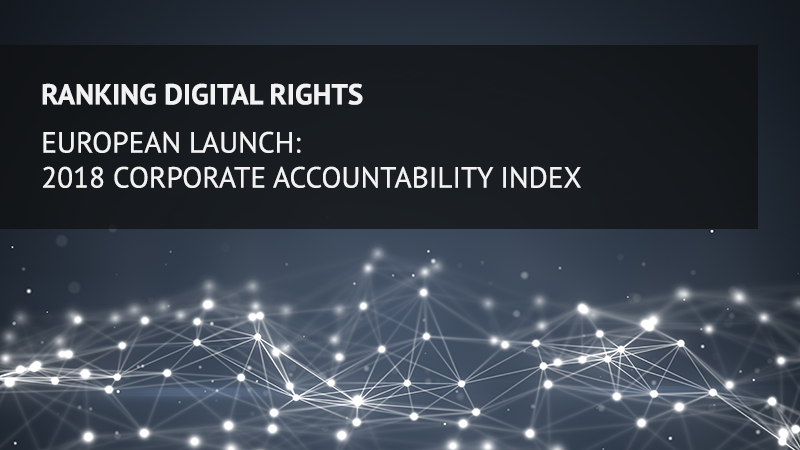 Join us on 2 May 2018 at 7 pm for the European Launch of the Ranking Digital Rights Corporate Accountability Index at HIIG. In our daily communications and activities, we rely on products, platforms, and services which are controlled by large corporations that have an enormous impact on our privacy and freedom of expression rights. On 2 May 2018, Ranking Digital Rights will hold the European launch of the 2018 Corporate Accountability Index, evaluating 22 of the world’s most powerful internet, mobile, and telecommunications companies on their disclosed commitments and policies affecting users’ freedom of expression and privacy, and examining the extent to which they are respecting these rights. The 2017 Corporate Accountability Index, which evaluated the same companies on the same questions, found that companies leave users largely in the dark about many important policies and practices affecting their rights. What has—or has not—changed in the past year? How do the latest Index findings relate to global controversies and debates about disinformation and hate speech online? Particularly in light of policy developments such as the NetzDG and the upcoming General Data Protection Regulation (GDPR) enforcement date, it’s an especially critical moment to consider the current status of ICT companies’ respect for privacy and freedom of expression rights, and how companies can improve. Ranking Digital Rights Director Rebecca MacKinnon will present key findings and highlights from the 2018 Index. A panel discussion is followed about what we can do as activists, scholars, consumers, investors, journalists, and citizens to ensure that technology is designed and governed in a way that is compatible with democracy and respects human rights.